Bragg’s apple cider vinegar is a brand of raw, unfiltered, organic cider vinegar with the mother that many people use to lose weight. Using apple cider vinegar for its health benefits and weight loss became popular in the 1920s. Paul Bragg, the founder of Bragg Live Foods, popularized using apple vinegar for its many health benefits. It is said that Bragg’s apple cider vinegar assists with weight loss because it helps regulate blood sugar levels, suppresses appetite, and increases satiety. Apple cider vinegar like the variety Bragg produces also has many other health benefits. Apart from weight loss, apple cider vinegar can help bring down cholesterol levels, flush toxins from your body, or help reduce the symptoms of heartburn. You can also use raw cider vinegar as a hair rinse to add shine to your hair and help control scalp infections like dandruff. In this article, you will learn how to use Bragg apple cider vinegar for weight loss. I will also examine what scientific research says about claims that apple cider vinegar diets help shed pounds of excess fat. According to the website Bragg.com, Bragg apple cider vinegar with the mother is raw cider vinegar made from organically grown apples. Bragg’s brand of apple cider vinegar is unfiltered, unheated, and unpasteurized. This means, that there are no chemicals or artificial additives in Bragg ACV. Many people claim that all the goodness of unprocessed, unfiltered apple cider vinegar is contained in the “mother.” That is why Bragg apple cider vinegar has become one of the most popular brands for weight-loss diets and other health benefits. Bragg’s ACV is raw and unprocessed. As already mentioned, unprocessed apple cider vinegar contains the “mother” that contains important enzymes and probiotics. Many of the health benefits of apple cider vinegar are directly related to these enzymes. Bragg’s ACV brand is certified organic. Many apples are sprayed with pesticides that make their way into your body. Buying organic apple cider vinegar means that you maximize the health potential from drinking diluted ACV. Unpasteurized apple cider vinegar. The pasteurization process can kill off many of the beneficial bacteria in apple cider vinegar. Vinegar is usually pasteurized and filtered to give it a clear appearance. However, it is recognized that unfiltered and unpasteurized vinegar is usually better quality than the pasteurized variety. The Bragg’s apple cider vinegar diet involves drinking 2 or 3 glasses of diluted apple cider vinegar a day. Most people drink ACV to assist with weight loss by drinking a glass about 30 minutes before their meal. This helps to improve digestion after eating and helps you feel fuller for longer time. Of course, taking apple cider vinegar pills or drinking diluted ACV as part of a weight-loss plan isn’t a miracle remedy. Losing weight healthily should involve eating healthy, well-balanced meals, getting enough daily exercise, and keeping yourself well-hydrated. Because the sharp, zingy taste can put people off drinking apple cider vinegar, you could make a weight-loss drink by adding honey to the mixture. At the end of the article, you will find a recipe for Bragg’s apple cider vinegar if you want to lose weight. There are other ways that help you lose belly fat without exercising. For example, consuming ginger regularly is one way to help speed up your slimming program. Other belly fat burning foods include foods that are high in fiber, protein, and water. How Does Bragg’s Apple Cider Vinegar Help You Lose Weight? The acetic acid content of apple cider vinegar drinks means that it keeps you feeling fuller for longer and helps to reduce the temptation to snack. The results of the study also showed that apple cider vinegar can help manage the symptoms of diabetes. It is also important to make healthy lifestyle choices to prevent type 2 diabetes. Insulin is a key hormone in metabolizing fat and absorbing blood sugar from the bloodstream. Insulin resistance can cause glucose levels to build up which may result in more fat stored in your body. If you suffer from type 2 diabetes and are using apple cider vinegar to help lose weight, you should also include certain spices. Please read my article on the best herbs and spices to control diabetes to see how to use cinnamon, turmeric, and ginger for diabetes. Apple cider vinegar can also improve digestion which can help you to lose weight and fat. 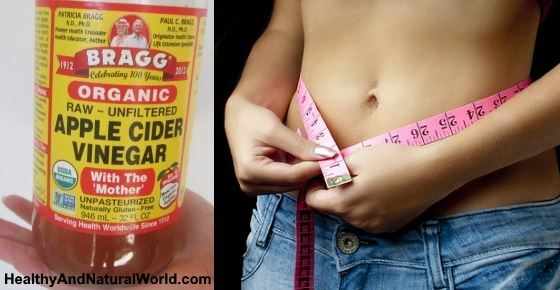 What is the best way to use Bragg apple cider vinegar if you want to reduce body fat mass and look slimmer? Mix 1 – 2 tbsp. apple cider vinegar in an 8-oz. glass of water. Add a teaspoon of raw honey and mix well (optional – to improve the flavor). Consume the apple cider vinegar drink 30 minutes before your breakfast and 30 minutes before your evening meal. Drink apple cider vinegar daily to get its health benefits and maintain a healthy weight. If the taste is too sharp and unpalatable, you could start off with less concentration of apple cider vinegar. Gradually increase how much apple cider vinegar you take in a glass of water to help your taste buds get used to it. To help see quicker results from using apple cider vinegar to lose weight, there are a number of other steps you can take. Avoid processed foods. Many processed foods contain high amounts of sugar, salt, and saturated fats that you may not even realize are there. For example, many fake foods contain high-fructose corn syrup, have little or no fiber content, or are high in fat. Use coconut oil. When using apple cider vinegar for losing weight, you should consider incorporating more coconut oil into your diet. For more information, please see my article on how to use coconut oil to lose weight. Exercise regularly. I’ve already mentioned the benefits of exercising regularly for losing weight. However, there are more benefits to your health. High-intensity interval training (HIIT) is one way to exercise to boost weight loss and can help you quickly lose weight from your face. Are There Side Effects of Consuming Bragg’s Apple Cider Vinegar? There is no specific amount of apple cider vinegar dosage for weight loss. But most people benefit from taking apple cider vinegar between 1 and 3 tablespoons a day diluted in a glass of water. It is easy to prevent any dental problems from drinking apple cider vinegar if you swish your mouth with clean water after consuming a glass of diluted cider vinegar. Also, you should avoid brushing your teeth for 30 minutes after taking the ACV health tonic. You should never drink apple cider vinegar undiluted to avoid irritating your esophagus or damaging tooth enamel. There is also a chance that taking regular doses of apple cider vinegar could interact with certain medications. Also, taking apple cider vinegar along with diuretics could cause a loss of potassium in the body due to increased urination. How Quickly Can You Lose Weight with Bragg’s Apple Cider Vinegar? When embarking on a Bragg’s apple cider vinegar diet, you should be reasonable in your expectations of weight loss. It may be possible to quickly lose water weight, however, real weight loss and a reduction in waist size come with burning body fat. Therefore, it’s important to be patient and keep up with regular exercising and limit your calorie intake. Let’s briefly look at some of the many other health benefits of using apple cider vinegar made by Bragg. Skin tonic. There are many reasons to wash your face with apple cider vinegar because it helps to cleanse your skin naturally. Diluted apple cider vinegar can destroy free radicals that cause visible signs of aging, help lighten age spots, and unclog your pores. Fights acne. You can also make a skin tonic from Bragg’s apple cider vinegar to help combat the symptoms of acne. Using apple cider vinegar for acne helps to remove acne-causing bacteria, reduce inflammation, and get rid of dead skin cells that can block pores. Hair conditioner for shiny hair. If you want to get rid of hair frizz and add luster to your hair, then you should rinse your hair with apple cider vinegar. Using apple cider vinegar as a conditioner helps to treat an itchy scalp, encourages hair growth naturally, and is a natural detangler. Detox your body. Consuming Bragg’s cider vinegar doesn’t just help with body weight loss but it also rids your body of toxins. You can try out some of my great ACV detox recipes to help cleanse your liver naturally to improve your general health. You can find Bragg’s apple cider vinegar in many health stores, supermarkets, and online stores (like this one). Bragg ACV is available in 16-oz., 32-oz., or 1-gallon bottles. If your local health store doesn’t stock apple cider vinegar with the Bragg label, you can look for similar types of apple cider vinegar. Make sure that the vinegar is raw, unprocessed, unfiltered, and organic. One way to check if the ACV is high quality is to give the bottle a shake and see if the mother in the apple cider vinegar turns the vinegar cloudy. Mol Nutr Food Res.2016 Aug;60(8):1837-49. BMC Gastroenterol. 2007; 7: 46. Open Heart. 2016; 3(2): e000469. Am J Clin Nutr.1998 Aug;68(2):226-34. Prog Cardiovasc Dis. 2014 Jan-Feb; 56(4): 441–447.